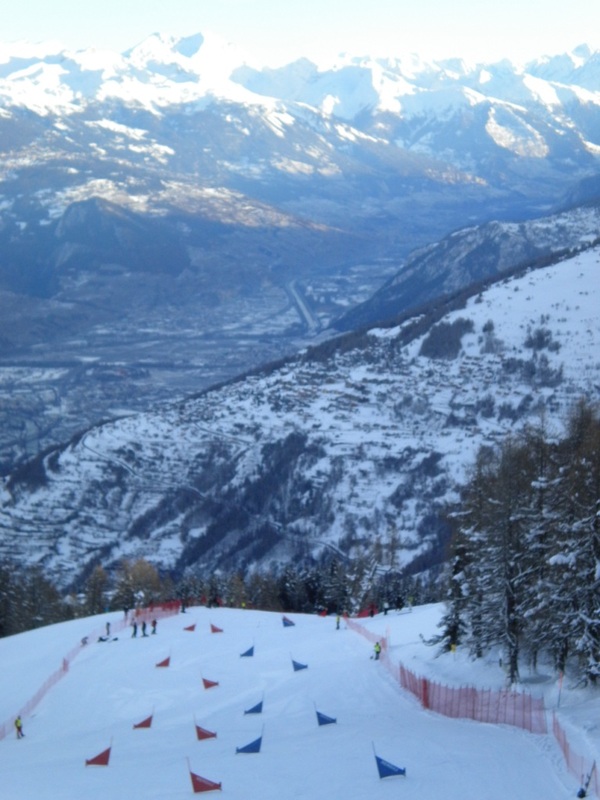 Nendaz, Switzerland – The Europa Cup was set on a fairly terrain-y slope, nothing steep but roll-y with some offsets. But that wasn’t the challenging part. The challenging part was the super turny set that you really had to set up for. Going too straight even on just one gate was a time killer as it would take several gates, as well as time, to get back on track. You had to be near technically perfect to race well. And as past blogs indicate, turny courses are not my forté. 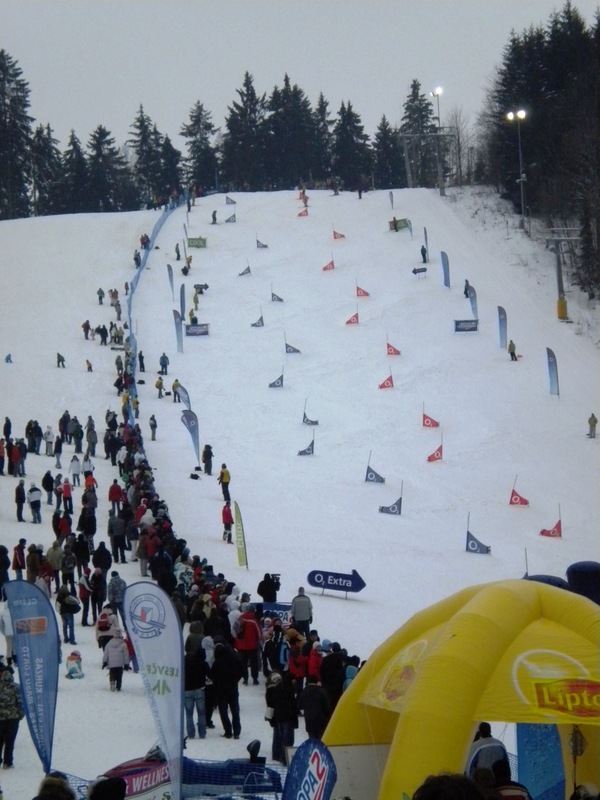 Most of the World Cup field participated since the upcoming World Cup is in three days on the same slope. My start number was 64, in the back of the pack. I don’t mind starting towards the end of the field because a rut is established by the time I start and I can witness areas in the course where people make mistakes. But it was a really cold day and the lower part of my body, especially my feet, was freezing up. After watching several girls, I knew I had to go really round, particularly on the first three gates. Before I went I stared at the point high above the second gate where I wanted to switch edges and initiate my turn. The first three gates felt good; I set up for them correctly and didn’t feel like I lost speed. But going into the flats I lost my focus and overturned on a heelside and dumped all my speed. I stayed on my feet and kept going. Then my straight riding came into play and I was cutting off heelside turns, and on one my nose of the board went over the stubby and I possibly DQ’ed if the gate judge caught it. I finished the course and it felt fine, but was out of contention. Regardless of what happens, I am doing my best. Given the resources and time I’ve had to dedicate to this goal, I can confidently say that. Marianske Lanze, Czech Republic – I almost didn’t write today’s blog. I wanted to wait until I could write good news. But I felt the best way to let go of the race will be get it out of my head, write about it, and move on. There were four less girls for today’s race. My only thought was to be aggressive. I knew I still had to ride under the stubbies, but in the past my best slalom races were when I was focused solely on getting down the hill fast. I thought about the technical issues when I was inspecting the course and waiting at the top, but I just wanted to be aggressive in the start. The first few gates were a little tough with icy, but grippy, conditions. I came too low on the third gate and slowed almost to a stop but still had the focus of getting down fast. I attacked the rest of the course and just let the board run. Even towards the end I wasn’t sure I was going to make it but I just kept going full tilt. I’d rather blow out with a fast run than finish with a slow one. There really wasn’t a thought in my head except to ‘go, go, go,’ and I finished the course. Eighth in my course! 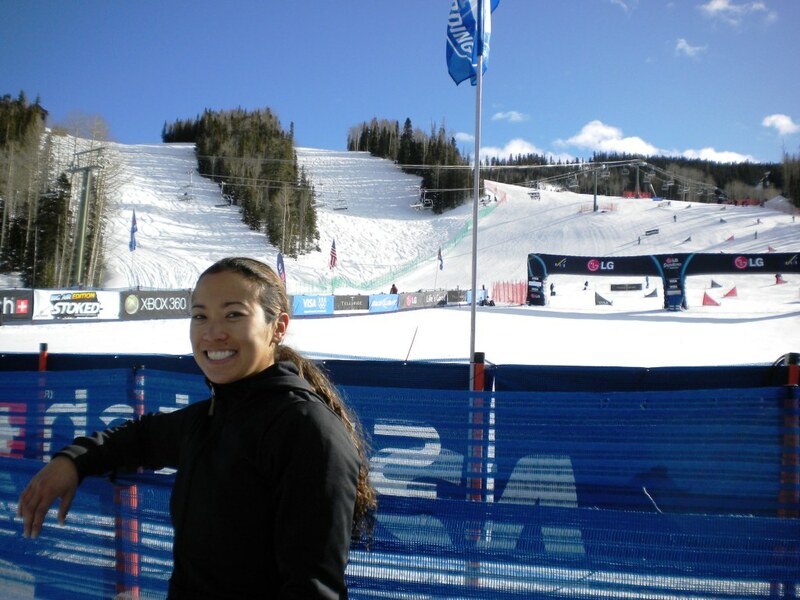 I was a bit nervous for the second run since I had a legitimate shot at getting in the top 16, the finals. But I still knew that I couldn’t be conservative, I still had to go for it in order to have a really good run. I had the same focus for the second run but I think I was thinking too far ahead of myself. My first few gates were good, with my line under the stubbies. I had a little bobble but just threw my body down into the next turn and got going again. The middle part of the course was pretty fast, probably because I was out of control and just throwing myself down the hill, hoping my board would follow. I gained on the girl I was racing and got too greedy. 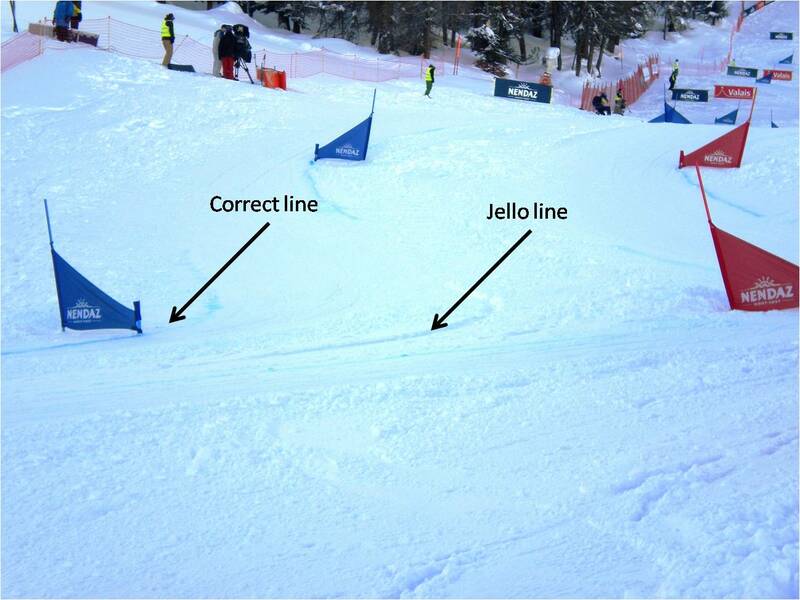 Started going too straight, and right after I had that thought, I went into a toeside turn five gates from the finish also too straight, hit the rut, washed out suddenly on my belly, and slid past the next two gates. Disqualified. I was so incredibly angry. Not sad. Pure fury. I wanted to throw my board into a tree (but didn’t). A stupid, stupid mistake. Had I just held on, I would have made the finals in a good position, possibly in the top 8. After seeing the times of the people that made the finals, even a conservative second run would have gotten me in. I’ve gone over and over it in my head: what I could’ve done to prevent it, the results I could’ve had. But ‘could haves’ are getting me nowhere. What will help is letting go of the negatives and focusing on the positives. The positives that I can take away are I really went for it and rode on the edge and out of control, the type of riding that I need to have for the next few races. I also had good riding, probably some of my best slalom riding ever. I know what focus works best for me in the gate. And I know I have the ability to ride fast. So while it was not the result I wanted, I have some great things to take into the next races, as well as even more drive and determination to make sure that doesn’t happen again. I guess it’s best to get the quirks out of my racing now before it really counts. Telluride, Colorado – I’m not sure whether to laugh or cry about today. Obviously I want to cry, but the hilarity of my run actually makes me want to laugh too. I noticed when I was slipping the course that my edges were really sharp. I even had trouble getting a smooth slip in because they would catch too well. But I didn’t think too much of it. It’s always great to have sharp edges to cut through if the course is icy (which it wasn’t) or to really hold the edge and not slide out. Of course that means you really have to commit to the carve. My sole focus was to be aggressive and get after it. As I was waiting for my run, I could feel the excitement building in me, the excitement that I was going to lay down an amazing run, the best run I’ve ever had or at least one equivalent to the best one I’ve ever had. I got into the start gate with the ‘bull’ mentality and went after it. I could feel the girl I was racing inching ahead of me and at that point I thought to myself, “I have to release the turn earlier than what I’m doing and really carve my heelsides.” (I’m actually surprised that I had that focused of a thought within a second of me riding.) So I release my toeside turn earlier than usual, but instead of riding it out longer to get in the right position to crank out my heelside, I just flipped board and got it on edge as high as I could. My sharp edges caught and I carved right at the stubby, directly hitting it and slicing it off of its screwed in base. I didn’t get affected by running it over, but I did think, “Oh no, I just DQed” since my board had to have run over it to cut it off. I just kept going but saw the freed stubby take a beeline right down the center of my course, on a crash collision with my board. Then I thought, “I’ve gotta beat this stubby and get around it or I’m going to run over it. Again.” I accelerated through a toeside and got past it. (I later heard that it was still chasing me through the next heelside but I managed to get past it again.) Clearly my focus as well as my line was lost, and I jammed too hard on a heelside, washed out and fell. I got up and continued the course and also continued to cut off my heelside turn. I’m pretty sure I DQ’d on another gate but kept going. Then at the gate at the top of the pitch I cranked the heelside too early AGAIN and this time my body went fully inside the panel, DQing AGAIN. A fall, destruction of course equipment and possibly three DQs – my run contained probably the worst elements a run could have, save a crash in the fence or collision with my competitor. I got down into the finish and just shook my head and almost laughed. What a show, a total comedy of errors. The only saving grace is that I was really going for it and even Coach Mark saw that. He also said I need to bring that into every training run. It was a huge lesson though and really showed me that I need to get familiar with what happens when I put that board on edge on a heelside. I just need to get used to it and know where it’ll take me in my line.